Do you fancy yourself a chocolate fanatic, a lover of all things dark, creamy, and delicious? If the answer is yes but you’re concerned that your sweet tooth is doing you more harm than good, then don’t despair. Scientific studies have shown that consuming chocolate—especially dark chocolate—in moderate amounts can benefit your health in some way. This is because chocolate contains certain elements that do a body good when consumed, such as mood-lifting chemicals, antioxidants, and other essential elements. And yes, before you ask, it generally applies to all forms of chocolate: from chocolate bars and confectionaries to chocolate milk drinks. It even applies to the chocolate-flavored versions of delicious and healthy milked nuts drinks, such as almond milk, peanuts milk and the like. That’s all well and good, but what kind of health benefits are we talking about, exactly? 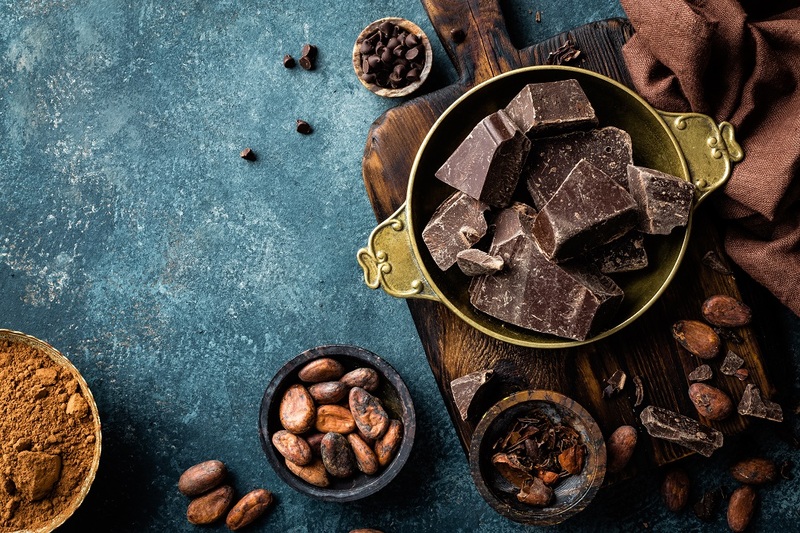 If you’re curious about to know the specifics, then read on below to find out five of the health benefits you get from eating chocolate. It can lift your mood. Let’s get the obvious out the way: chocolate, especially for those who are big fans of it, has a general mood-lifting effect. The taste, smell, and texture of chocolate specifically can stimulate the pleasure centers of the brain, which of course translates to a more pleasant, mood-lifting high. That’s not all, however. Chocolate also contains the essential amino acid Tryptophan, which stimulates the production of serotonin, the human body’s natural anti-depressant. So even if you’re not that big of a fan of chocolate that you find yourself physically reacting to eating it, you’re still going to get its mood-lifting effects. Besides improving your mood, eating chocolate can also lower your blood pressure, reduce the risk of strokes, and reduce inflammation in your body and organs—three things that can definitely benefit your heart health. This is thanks to the tasty treat’s high flavonoid content, which already sports a lot of health benefits, such as preventing cancers, respiratory ailments, and other serious health conditions. Flavonoids are also known to induce the production of nitric oxide in the human body, which has a widening and relaxing effect on blood vessels, lowering blood pressure even more. It lowers your blood cholesterol, protecting your circulatory system. The flavonoids detected in chocolate are also known to help stop the accumulation of LDL, which is the bad kind of cholesterol that tends to build up in arteries as plaque. Unchecked accumulation of plaque in arteries, especially in key points such as in the heart and brain, can result in heart attacks and stroke. This can be attributed to stearic acid, a type of saturated fat that exists within flavonoids. Stearic acid has been observed to potentially increase the level of HDL cholesterol in the blood—the “good cholesterol” that prevents bad cholesterol cells from binding into each other and gunking up the works. If you’re having a hard time trying to sleep with a particularly pesky cough and your cough medicine isn’t helping much, you can try nibbling on a bit of dark chocolate to calm your throat a bit. Theobromine, a naturally-occurring chemical in chocolate, has the ability to suppress coughing by acting on the vagus nerve. The vagus nerve is responsible for carrying messages from the central nervous system to the brain, so confusing it a bit with some chocolate will help suppress your coughing reflex and allow you to sleep uninterrupted. It can help stave off Alzheimer’s disease. Finally, having your daily dose of chocolate can also help delay or prevent degenerative diseases that attack the brain specifically, such as Alzheimer’s disease. Epicatechin, a chemical found in cocoa and green tea, has been proven to protect our gray matter from the formation of amyloid plaques, a type of protein that’s associated with Alzheimer’s disease. There you have it, five big reasons why having chocolate as a daily snack is healthy for you. Just remember not to indulge too much, as while chocolate does have its health benefits, having too many servings in one day can have a detrimental effect on your weight and metabolism. This can easily cancel out the good things about eating chocolate. Everything in moderation and nothing in excess! good2grow Mystery 3 Pack arriving at a Walmart near you! Health issue is really important. But do you agree that studying succhessfully is essential too? If so, check out https://edubirdie.com/essay-writing-help-online for getting help in writing essays.